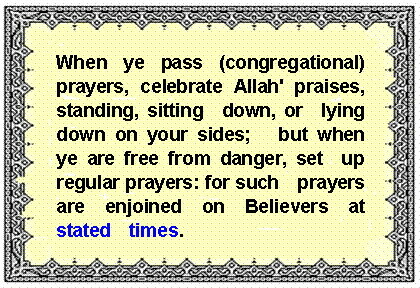 Prayers in Islam " Salat "
The Prayer involves a sequence of changes in body posture with simultaneous Arabic recitation. Each prayer is divided into subunits (rakats). There are different types of rakats (fardh, sunnah, nafl and witr) which are performed in slightly different ways from each other. The five prayers consist of different number and type of subunits. Fajr: the morning prayer which is performed after the start of the dawn. Zuhr: the noon prayer which is performed after the sun has passed it�s zenith. 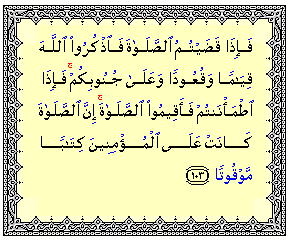 Maghrib: this prayer is performed after sunset. Isha: the evening prayer which is performed after the end of dusk. Fortunately, Osaka University afford OMA members a small room where they can perform the daily prayers with ease. So, all Muslim students have the opportunity to keep praying even in groups " Jamaha " as recommended in Islam. This room is situated in the second floor of the building just behind the COOP and Appetite Restaurant. OMA members are responsible to keep this room as much clean as possible. Osaka Muslim students usually pray four times daily in the room: Zuhr (12:15 pm), Asr (3:15 pm), Maghrib (6:00 pm) and Isha (7:00 pm). The schedule is quite different according to the prayer times as estimated according to the Hijra calendar. Daily Prayer Times in Osaka: Click here The easiest prayer times ever known with an automatic caller to the Adhan. Friday prayer is a unique Islamic prayer, performed only in groups " Jama'h ", and so every Muslim should participate as possible. It is scheduled every week about 12:15 - 1:00 pm at the room. It is started by Adhan, succeeded by a special speech " Khutba " and finished by the prayer. Khutba is considered as a central ceremony, which is traditionally presented by someone who is referred to as Khatib. There are some essential guidelines to be fulfilled for the most recommended Khutba (Click here for more information). OMA called all brothers to be enrolled in such an essential activity and prepare a khutba and present it someday according to a specified list (Illustrated below). Traditionally, the khutba is divided into two parts, which are considered as two khutbas. The khatib performs both khutbas standing, but he sits down for a moment between the two for Dowaa. The khatib should attend as early as possible (i.e. 12:15 pm). The khutba is preferable to be short, brief and constructive. The khutba is preferable to be presented in both Arabic and English languages. The khatib is requested to send OMA a copy of his Khutba to organize an archive for help.